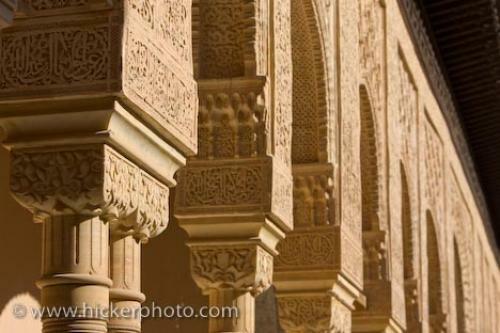 The beautiful moorish architecture has been retained throughout the Casa Real (Royal House) at La Alhamba in Granada, Spain and is seen on columns, ceilings, archways, and walls. Throughout the Casa Real, the Royal House at La Alhambra situated in the city of Granada, Spain, evidence of moorish architecture and art can be seen, even on each of the 124 highly decorated columns which surround the Court of the Lions. Arabesque ornamental designs flow throughout the Royal House and every building at La Alhambra which was the site of the last moorish stronghold in Andalusia (which ended at the end of the 15th century). Details of columns in the Chamber of the Lions (Cuarto de los Leones), The Royal House (Casa Real), The Alhambra (La Alhambra) - designated a UNESCO World Heritage Site, City of Granada, Province of Granada, Andalusia (Andalucia), Spain, Europe. Court of the Lions at the Casa Real in La Alhambra, Granada, Spain.